One of my readers (hope you are reading this, Mr. Z) asked for more posts about fashion and art inspiration. This one just clicked as soon as I saw the images. The previous post included a series of photos of Ragnhild Jevne by Marcus Ohlsson for the April issue of Velvet Magazine. Shot in a sandy landscape, it did remind me of the Byron poem I referenced, but it also pulled up a familiar image in my mind’s database. 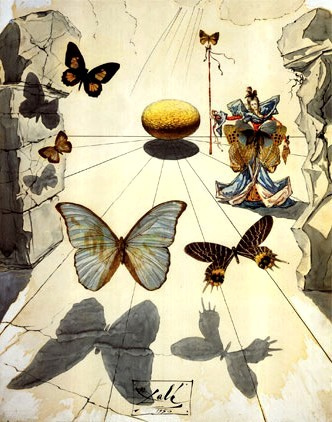 …with this painting by Dali. I bought the print a few years ago in Paris. The composition is amazingly similar – the female figure in the foreground, a shadowy figure in the background amid a desert landscape. 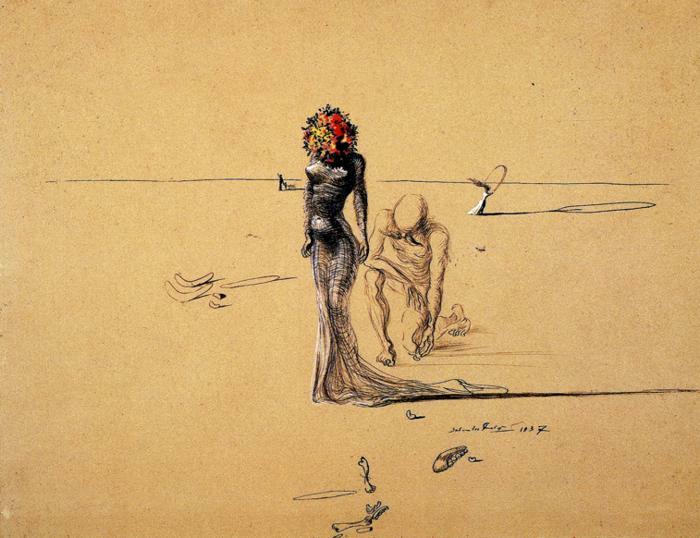 The afro wig in the current image reflects Dali’s head of flowers and the trail of fabric sings the same way in both. The McQueen shoes in the photograph (from SS10) were labelled misogynistic – a major theme in surrealist art. Dali’s depictions of women do vary. The head of flowers moved me when I saw the original painting in Espace Dali Montmartre – with the moustached man (not so sublte, Mr. Dali!) at her mercy. This one seems to reverse roles from the usual commentary in surrealist art. I could look at that head of flowers for hours. 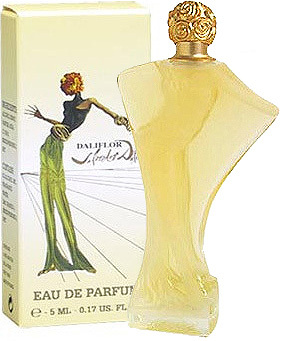 The gesture in another photo echoes the perfume bottle and box that Dali designed for Daliflor. The Catalan painter and history-maker also created these landscapes – with butterflies. 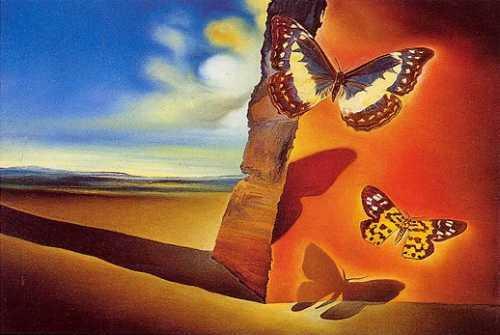 Dali dabbled in butterflies, but for a painting or few. Notice the couture-clad woman in the last one. 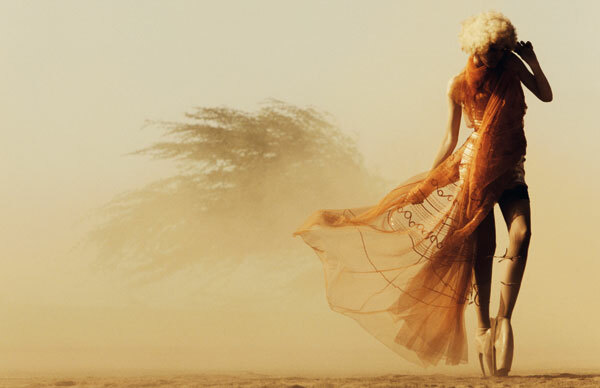 Well, the combination of the butterlies and fashion reminds me of a recent example of circling butterflies by Mr. McQueen, who was heavily influenced by art in its various forms for so many of his collections. 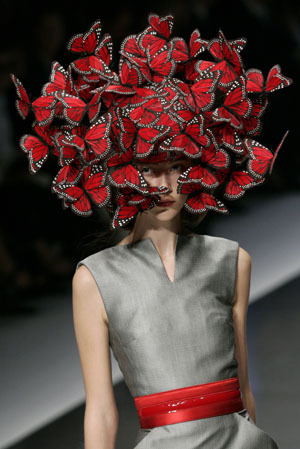 Amongst butterflies, at McQueen’s SS 2008 collection. The tilt of the torso in the runway shot brings me back to the same Dali flowered woman. Note the grey dress, cut to accent the shape of the body, similar to the figure in the painting. You could say both Dali and McQueen had a head for details. They are probably having tea and discussing such divine details in the universe beyond, as we speak! So there you have it – photographs that likely had their roots in painting which then fed fashion. Art lives and breathes in so many iterations – it’s a circle of influence, completed and continuous. [Update May 17: forgot one] Inspiration: German Expressionism for Fall 09?